The author is one of our local librarians and I went last week to her book launch party in our local Library and of course bought a copy to support her endeavours. Quite often after a few pages I find such books are not for me and give up. Not so with this one. I was hooked early on by the story Fenn the foundling babe found by the ship wrecking Halflin whom he grows up knowing as his grandfather. Marked out as a Seaborn due to his cut apart webbed feet, Fenn has to remain hidden from the Terra Firma led by Chilstone who are seeking to stamp out Seaborn resistance to their rule following the flooding of most of the world because of climatic change. 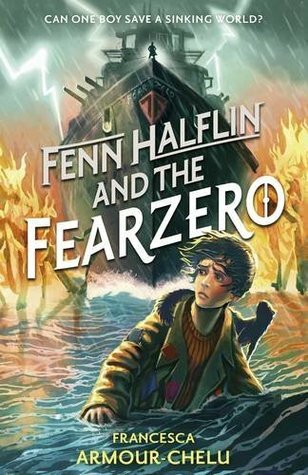 This review contains SPOILERS - Inevitably there will be comparisons to JK Rowling’s Harry Potter, to the Kevin Costner film Waterworld and other post apocalyptic tales, but in my opinion Fenn Halflin and the FearZero holds its own. The reader sympathises with the boy as he sneaks out from his confinement to spy on his grandfather at work, empathises with him as he is sent away aboard a ship to escape the coming wrath of Chilstone, fears for his wellbeing when set adrift in The Shanties to fend for himself. There Fenn ends up in a Dickensian nightmare reminiscent of Oliver Twist when he falls into the hands of Fagin-like Nile but the reader cheers on his camaraderie and concern for others as he shares his takings from selling rat meat with his companions to steer them clear of Nile’s wrath and maintain their rations of food. In this unlikely place he finds friendship amongst the other children working for Nile, but no sooner has he done so than Chilstone’s men are upon them again. As Fenn saves the day our story is again disrupted by the uncovering of Nile’s real reason for keeping the children working for him and where others have disappeared to. In a hilarious, yet heart rending, rat infested waterside scene the friends finally escape to unknown freedom. They go of in search of Fenn’s grandfather and a place of safety, but Fenn is now much more aware of the world, its politics, and his place in it and recalling his grandfather’s analysis of an animal’s options as being to kill, be killed, to hide or to run, he is not going back to hide but is going back to fight. His parting of the ways from his friends as they set of to find their safe haven, leaves him alone once more, but we hope not for long as the beacon of resistance is lit and Fenn and us await the world’s response to it in Volume 2 Fenn Halflin and the Rising of the Seaborn. ashramblings verdict 4* Page turner! Excellent first novel. Really looking forward to Vol2.